Written, produced and directed by Stanley Kubrick. Based on a novel by William Makepeace Thackeray. Cinematography by John Alcott. Music by Leonard Rosenman (including Handel, Schubert, J.S. Bach, Mozart, Vivaldi...) Production design by Ken Adam. TITLE: Part I. By What Means Redmond Barry Acquired the Style and Title of Barry Lyndon. TITLE: Part II. Containing an Account of the Misfortunes and Disasters Which Befell Barry Lyndon. Before the first shot of "Barry Lyndon" hits the screen, we know what will happen by intermission. And immediately after intermission we learn, more or less, how the movie, and the life of our eponymous hero, will end: in misfortune and disaster. But Redmond Barry (known, for a time, by the title of Barry Lyndon) is consistently thwarted in the pursuit of his goal for the simple reason that he has been written into existence by William Makepeace Thackeray and framed by Stanley Kubrick: Barry is a prisoner of mise-en-scene, trapped in a work of art, just as all we creatures who suffer from self-awareness are imprisoned by our Darwinian destinies. Somewhere, over eons of evolution or at the subatomic level of quantum physics, everything breaks down and becomes random -- or predetermined (depending on how you look at it) or both. Einstein famously avowed that "God does not play dice." Human beings have no choice. Which brings us to art, and man's attempts to play God. Watching the wryly comic adventures of Barry Lyndon from a huge (one might even say cosmic) ironic distance, you begin to sense that Kubrick is both ennobling and immortalizing this fictional rascal through the very act of focusing his attention on him on film. Perhaps this is the closest Kubrick will come to displaying something like mercy or compassion (even affection) for one of the pitiful microbial creatures he subjects to such scrutiny in one of his icy prison-palaces -- gilded fortresses in whose rooms the past, present, and future often coexist, as if time were not a process but a place, a maze. After all, on the grand scale of things, Barry's plight is ours. The opening shot (after the Part I title) is a breathtakingly beautiful 18th-century landscape canvas in a static motion picture frame. Two small human silhouettes prepare to fight a duel. The narrator begins an account of Barry's father who, we are told, "no doubt ... would have made an eminent figure in his profession" (gunfire; one "figger" falls into the landscape) "... had he not been killed in a duel over the purchase of some horses." The narration, coupled with this awe-inspiring first image, sets our story firmly in the past -- and, more importantly, in the past tense. Film, after all, is a medium in which the recorded past is recreated in the present every time it is run through a projector. The immediacy of the images and the action onscreen is an illusion: This has all happened before, been recorded, and is now being played back before our eyes. The narration here acts something like those labyrinthine Steadicam tracking shots in "The Shining": It may be guiding the characters' actions, deterministically pushing/pulling them through the course of their lives, or it may be merely following them around, but it is probably doing both at once. In that instant in which the figure representing Barry's father is felled even as the narrator announces his death, all distinctions between free will and predestination, between onscreen action and offscreen narration, are dissolved. "The Shining"'s Jack Torrance has "always been the caretaker" of the Overlook Hotel; like Jack, Barry is doomed to recreate the past in the present, reliving his life endlessly as if it were a film loop -- because it is. Everything in "Barry Lyndon" is similarly "arranged" by unseen hands (unseen by the characters, by us, or by both) to fit some preordained design. Sometimes this design is arranged by the characters (Nora's marriage to, and Barry's duel with, Captain Quin; the Chevalier de Balibari's escape to England; Barry's and Chevalier's "luck" at cards), by predestination or fate (the deaths of Grogan, Bryan, and Sir Charles Lyndon; the singular "accident" which enables Barry to escape the army) -- and, always, by Stanley Kubrick. 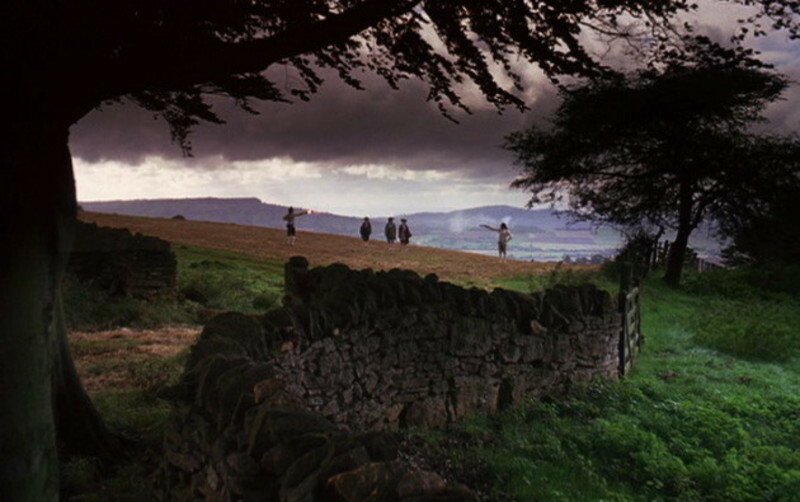 If "The Shining" is characterized by the tracking shot, "Barry Lyndon" is similarly characterized by the stationary camera and the slow, stately zoom-out or -in on a symmetrical composition (usually with Barry at the center -- it's his story). Kubrick rarely moves the camera in this film -- the elements in each shot are locked together in a precise pattern within the frame, increasing the sense of design and destiny. (The images are two-dimensional, like paintings in a gallery.) In order to maintain the detached, godlike stance of the narrator, the camera must not involve itself with the objects it observes. A zoom allows the camera to optically magnify the image while maintaining its distance. The camera's human subjects present themselves to the lenses as though they were in a picture frame, the subjects of an oil portrait. "Barry Lyndon" is a world in which every man/object has its place and nothing can be out of place. It is a world clamped tightly inside a rectangle. Kubrick's frame keeps Barry boxed in, more so even that the rigid social conventions of his time and place. The three times Kubrick does allow his camera to become directly involved in the action, it is within a carefully defined, four-cornered space: the boxing match ("We will form a square for that purpose"); Lady Lyndon's suicide attempt (in her beautifully-furnished bedroom); and Barry's physical attack on Lord Bullingdon (in an echoing, hardwood-floored concert chamber). In each case, the box or the square signifies a social arena in which some conflict is played out. The boxing square, like the duel or the card table, is a legitimate forum for the settling of disputes in a contest of skill and/or luck. A bedroom is most certainly the proper place to commit suicide -- a private space in which to resolve one's inner conflicts, through sleep, dreams, or death. But Barry's public display of passionate violence against Bullingdon is, like the tossing of the glass in Quin's face, a rash, socially inappropriate act which contributes to his downfall. "How different Barry's fate might have been," the narrator intones early in the film, "had he not fallen in love with Nora and had he not thrown the glass of wine at Captain Quin ...." He might later have added: " ... And had he not attacked Lord Bullingdon, and had he not fired his pistol into the ground ...." But Barry's character is his destiny, and he can no more escape it than could Oedipus. Barry's attempts to master his fate and behave -- or at least appear to behave -- like a gentleman are quite touching in the light of his inevitable (after the Part II title) failure. He fights duels, pitting his own skill against the whims of fate. He assists the Chevalier at cards (more skill -- at cheating -- than luck-of-the-draw) -- and what better, more pathetic metaphor for Man's attempts to master chance/fate than those of a gambler and con artist cheating in an effort to master "the odds"? He woos and marries into a wealthy, respectable family; he pursues a peerage (and, not coincidentally, the title of Lord) so that he and his heirs may become, in Lord Wendover's words, "safe ... people about whom there is no question." He fathers a son so that the glorious and hard-won name of Barry Lyndon should be passed down, and, one presumes, further enhanced and glorified, with each succeeding generation. Early in Part II, however, the narrator informs us that Barry will lose everything: "But fate had determined that he should leave none of his race behind him, and that he should die alone and penniless ...." And later: "Barry was one of those born game enough at gaining a fortune, but incapable of keeping one." Character, fate, birth-these elements work as one, like the mechanisms of a watch, keeping Barry's life ticking inexorably toward its conclusion. Barry vows repeatedly "never again to fall from the rank of a gentleman." And repeatedly he fails. But Barry does achieve one great moment of existential triumph, which also happens to coincide with the moment of his ultimate destruction. They are one and the same. In the duel with Lord Bullingdon, Barry, for once in his life, behaves honorably and like a gentleman -- indeed he does not actually become a gentleman until the moment when he fires his pistol into the ground instead of at Lord Bullingdon. For an instant, Barry holds his fate in his own hands: He can do away with Bullingdon forever and still be playing strictly by the rules of proper conduct, or he can leave his fate up to Bullingdon. Barry, who was so moved by the aesthetic splendor of the Chevalier's appearance, here displays a kind of aesthetic style and grace that, even without an officially recognized title, is the mark of a gentleman. It is Bullingdon who is vulgar, who behaves dishonorably, when he hasn't the good grace to consider the matter "honorably settled." Gloriously, paradoxically, Barry attains his measure of nobility -- and humanity -- at the very moment of losing everything else. (This incident, by the way, is Kubrick's -- not Thackeray's.) It is his purest act of free will as a human being ... and it seals his fate, consigns him to oblivion -- a terrible lot that is bitterly ironic and profoundly touching.